CSBN researchers are ready to put their funding to good use. 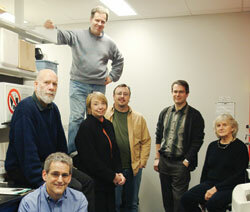 Standing in the back is Richard Courtemanche, the only exercise scientist among the psychology professors. From left: Shimon Amir (seated), Barbara Woodside, Wayne Brake, Andrew Chapman and Jane Stewart is seated on the far right. Peter Shizgal is crouched in front. In the case of the Centre for Studies in Behavioral Neurobiology, collegiality really works. The research centre, one of the jewels in Concordia’s crown, has been given an infrastructure grant of $1 million over four years by the Fonds de la recherche en santé du Québec (FRSQ), the province’s medical granting agency. It’s the first time a university without a faculty of medicine has been given such funding in the area of health. However, it’s not the first time the CSBN has turned heads. Founded in 1982 by four senior researchers, the Centre has been the source of many articles over the years. Current director Barbara Woodside thinks she knows why. When the CSBN was launched by Jane Stewart, Roy Wise, Zalman Amit and Peter Shizgal, its primary focus was on the neurobiological mechanisms involved in drug addiction. As the years went on, that interest expanded to include a much broader range of appetite motivation. This question has led the researchers down some unexpected paths. They have explored sexual attraction, pregnancy and lactation, the “obesity hormone” leptin and the rush of gambling, among other phenomena. Baby boomers who have started losing their eyeglasses will be glad to know the Centre is looking at learning and memory. The successful proposal to the FRSQ is focused on the poor choices many people make with regard to their health. In order to understand the increase in cardiovascular disease and Type II diabetes, the CSBN researchers say, we need to understand the processes underlying the maladaptive choices that contribute to them. The FRSQ report remarked on the Centre’s wide application to health issues, and noted how dynamic and active the CSBN is. It has 11 regular members, all faculty at Concordia, and six associate members: two at Concordia, two at the Douglas Hospital Research Centre, one at Université Laval and one at the Centre de recherche Fernand-Séguin. Altogether, the CSBN is 137 people, including principal investigators, research trainees, support staff and technical personnel. The 107 trainees in the CSBN include eight postdoctoral fellows and 39 graduate students. About 60 undergraduate students pass through the Centre’s lab every year, and many stay in touch after graduation. Woodside said the Centre benefits greatly from synergy with the other strong research centres at the university, notably the Centre for Research in Human Development and the Centre for the Study of Learning Processes. The FRSQ funds will enable the Centre to hire molecular biology technicians, pay postdoctoral fellows, travel to conferences, and do all the things that drive laboratory research forward. “It will enable us to move our research to the next level,” Woodside said happily.